Whilst Samsung remains the boss in the mobile phone market, new research published this week shows the power Apple has over the tablet market. The research revealed that Apple iPads send almost 95% of all traffic to websites originating from a tablet computer. The iPad, launched in 2010, has rapidly gained popularity, with the market share controlled by Apple rising steadily as a result. 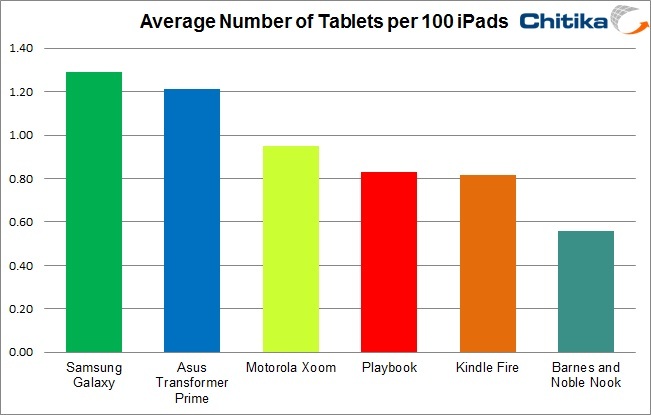 Chitikia Insights wanted to see just how powerful the iPad was however, so conducted research across their advertising network to determine the proportion of ad impressions generated by tablet type. They found that the iPad was overwhelming victor, delivering 94.64% of all tablet based traffic. As you can see below, the competition flounder in the wake of the iPad, with the next closest being the Samsung Galaxy with a paltry 1.22% of the traffic market. Of course it is worth remembering that devices such as the Kindle and the Nook are primarily used as e-readers and so web traffic from them cannot be expected to be that high. Nevertheless it remains an incredibly powerful position held by Apple in this rapidly growing sector. Can any of the competition knock them off of their perch? It remains hard to see how it can be achieved given Apple’s dominance yet with China growing in prosperity they represent a vast market for tablet computers. Thus far the region has shown a liking for Android based machines, which represents a glimmer of hope for South Korean company Samsung. Bendable & Unbreakable Smartphone Displays in Production - LG Confirms! !